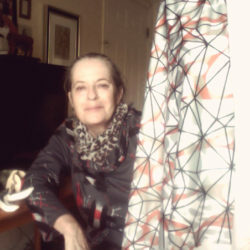 This is the ninth in a series of posts describing the projects that are part of our 2012 Spoonflower Staff Challenge. Voting begins on Thursday, March 15, 2012. When Jennifer and I (Kim) were paired up for this staff challenge, we were in almost immediate agreement that our project would be to decoupage some large-scale fabric motifs onto a vintage, fixer-upper piece of furniture. Our main goal was to end up with something that one of us would actually use but in all honesty, we were pretty pleased to have an excuse to indulge our shared obsession with thrift shop and vintage store shopping. We briefly toyed with the idea of a stealth redesign raid involving a giant squid, a scuba diver, and Stephen’s desk, but Jennifer worried this might annoy Stephen. Plus, we wouldn’t have that excellent reason to make the rounds of all the secondhand stores in our area. Stephen’s desk was left in all its pristine, 1980’s veneer glory then, and we began scouring our local thrift and re-use shops, keeping our eyes peeled for curbside scores, and trawling Craigslist for furniture fodder to work some magic on. Despite being seasoned thrifters, though, we didn’t find a darn thing that we thought would work. I was on my eighth trip or so, this time to an unheated junque shop in Carrboro, NC on a cold, rainy day. There were some nicer pieces of furniture that would have worked but were out of our price range. Too bad. There was also a huge, homemade, folding screen that someone had assembled out of solid wood panels, metal caster wheels, and 1960’s era travel posters. It would be incredibly cool it it were refinished and had some large flowers or some such shellacked onto it, but it was massively heavy, much too big for my old Honda, and I wasn’t sure I could bring myself to destroy those posters. Sigh. I left the shop chilled, discouraged and with a runny nose. Pausing in the parking lot, I pulled out a handkerchief to wipe my nose and consider our options, and then it hit me. Hankies! I emailed Jennifer with the idea right away, and she was down with it. Jennifer remembered as a child that a dear aunt always carried pretty, embroidered hankies, and was excited about the prospect of designing a new collection that could riff on old designs. Jennifer describes her reaction to the idea this way: From an early age, I've always liked older items. Vintage, thrift, and consignment are the words I associate with most of my purchases. 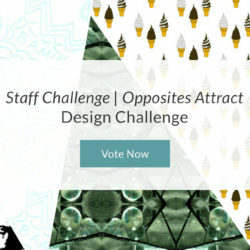 So when Kim proposed something as quaint as designing handkerchiefs for the contest, my interest was instantly piqued. 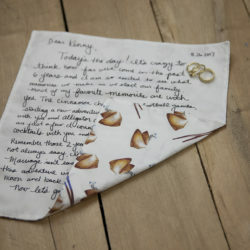 Then when Kim brought in some of her own collection of vintage handkerchiefs for inspiration, I was hooked – each one was so delicate and unique. As I was scanning, I began to take notice of elements I wanted to incorporate into our versions: floral, graphic, plaid, symmetrical, warm and cool, contrast. I tried to pull all the vintage elements that I liked, like floral motifs, but included more bold color choices to modernize things a bit. While I was designing, I opened the scanned files of the original hankies in Photoshop and tried to mimic some of the elements I wanted to keep and cut away elements I didn’t want to use. The most important Photoshop tools I used were the Magic Eraser and the Replace Color tool. The magic eraser will delete swaths of similarly hued pixels, which I used to delete the white fabric that was scanned in. I also used the Color Range tool, particularly on my floral design, because I wanted to keep the style of the flowers while adding my own spin with colors. For example, after cutting away all the excess design and background noise, I selected Color Range from the Select toolbar menu, then selected the yellow color in the flowers as the color to replace. All of the yellow colors were then selected and I could replace the color consistently and easily. I have to admit, it was hard to choose just one design style … so I didn't. I did manage to narrow it down to three varieties: a grid-like design with dotty accents, a feminine floral and a color-blocked, retro design. 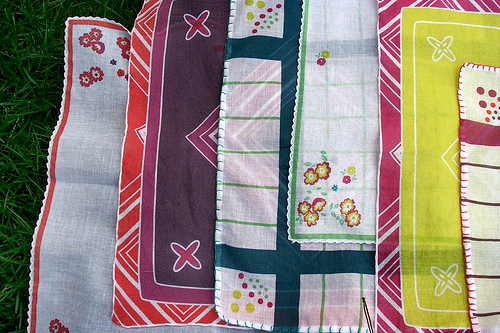 To further narrow down our design theme, I chose warm and cool colorways that reminded me of some of the vintage hankies from Kim’s collection. 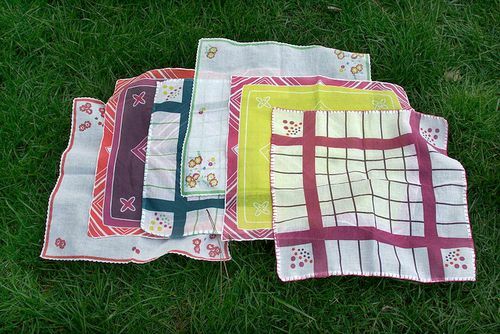 Jennifer’s handkerchief collection consists of six pretty, coordinating hankies that print three across and two down onto a yard of 54-inch wide cotton voile. 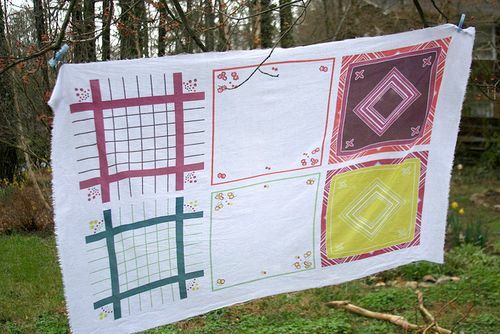 The voile is perfect for hankies because it’s soft and lightweight, and very gentle on a tender nose. Jennifer sized each handkerchief at a generous 16 inches square and included a half-inch seam allowance around each hankie. 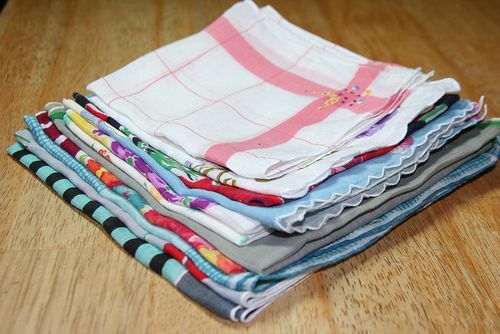 At first we worried that 16 inches might be too big, but when I measured some of my larger vintage hankies, I found that many of them were also 16-inches wide. Perfect, then! And surely if people’s heads and feet and bodies in general are a little larger now than they were then, maybe our noses are, too? Jennifer: Kim and I both work in customer service, so when I realized I had the chance to explain how to create and size a master file containing six separate designs, I got pretty excited. 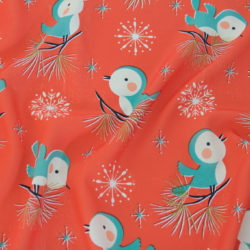 The Spoonflower help desk gets that question pretty often and while it’s not the most complicated process, it does involve a few necessary steps so that you don’t end up cussing out your computer screen (or worse, your printed fabric). See my tutorial on creating a master layout using Adobe Illustrator and Photoshop. 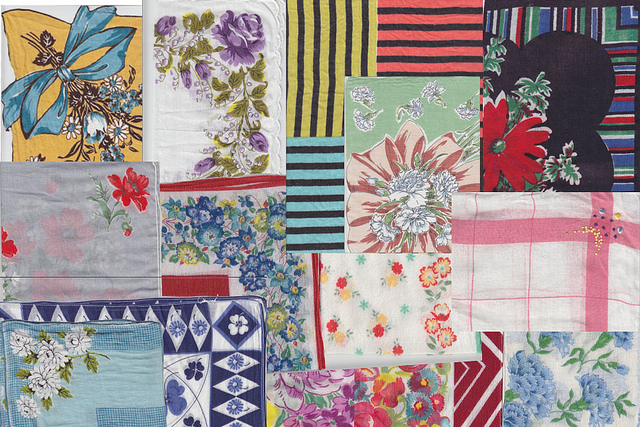 Kim: I use hankies almost daily, but I’ve never stitched them up myself. In looking at the finishing on some of my vintage versions, there were lots of different hem options. I decided to try a few methods out, and they all turned out well. Hemming dainty little items like these is a little futzy, but enjoyable if you like handwork like I do. Jennifer: In my opinion, the designs don't need to live and die by their final print. The prints themselves allow for the option of adding embroidery, particularly the plaid, dotty versions. Since it was so easy to replace and change colors, customization can continue for as long as you hang on to the original files. And thanks to Kim’s sewing prowess, a variety of hemming and finishing options added personality to otherwise square pieces of fabric. Finally, lest we forget actual functionality, each measures large enough to be knotted into a cute neck kerchief, bandanna, or even a pretty little doily. Or you can just wipe your nose without creating waste. Versatile! Eco-friendly! What can’t a hankie do? oh, these are fabulous! I collect vintage hankies, and these look authentic and excellent! Thanks for this post. My husband and I use cloth handkerchiefs almost exclusively (we have a box of tissues for guests that has lasted for several years). 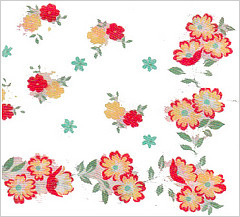 I was searching the spoonflower site to see what fabric I should use when I have my own designs printed. Thanks for the info. It was just what I needed.